The new premium customer facility offers space for around 400 Business Class and Star Alliance Gold passengers, including an exclusive area for First Class passengers. 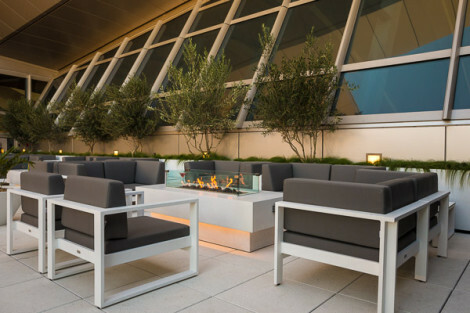 Designed by global architectural firm Gensler, the 18,000 square foot (1,675 square meter) lounge features a unique open air terrace, offering panoramic views of the northern runway towards the Hollywood Hills. This outdoor terrace provides passengers with an unparalleled sensory experience, complete with fire pits and a water wall. Member carrier Air New Zealand was appointed to develop and manage the Alliance’s new lounge at Los Angeles International Airport, which is part of the expansion of TBIT. The lounge’s experience zones are designed to accommodate passenger needs ranging from social gatherings to quiet time away from home. In addition to the outdoor terrace, the lounge offers a bar area for socializing, a library space, a den, a study and a media room. For those wishing to freshen before their flight can do so in one of eight shower rooms available. Guests wishing to work will be able to do so from various locations throughout the lounge, which is equipped with high-speed wi-fi and offers printing, fax and copy services on request. In addition to traditional power outlets customer can also make use of USB power ports to recharge their mobile devices. For those traveling “light”, tablet computers are available on request for use in the lounge. The design of the lounge is inspired by a contemporary interpretation of modernist L.A. architecture of the 1950s and 1960s. This concept is in line with new guidelines for Star Alliance branded lounges, which aim to better meet the evolving needs of today’s traveler while at the same time introducing a local flavor in each location. Black and white photos, inspired by L.A. and shot by renowned photographer Peter Lik, complement the Alliance’s corporate colors. The lounge incorporates other new look brand elements Star Alliance has adopted for use in its lounges around the world. In addition to local design inspiration, Star Alliance also selected locally sourced products and furniture wherever possible. Its glazed ceramic tile feature walls were created by local artisans. In total, eight Star Alliance member carriers operate out of the Tom Bradley International Terminal – ANA, Asiana Airlines, EVA Air, Lufthansa, Singapore Airlines, SWISS, THAI and Turkish Airlines. Air New Zealand will move to the terminal in mid-2014, at which stage its Koru Lounge in Terminal 2 will close. Together, these airlines account for more than 30% of Star Alliance’s international flights in and out of LAX. With all member airlines operating wide body aircraft from TBIT, this translates into more than 50% of the Alliance’s international seats on offer in and out of LAX. You know it’s nice when you see Ann Sacks tiles! Probably a stupid question, but will United Club members be allowed or just the aforementioned, First, Business, and Star Gold travelers? I can’t wait to check this out! This looks so much better than the current *A lounge! woohoo i am flying out this saturday via LAX to sydney on united biz class.. i should be able to access this lounge right? But I heard that the UA terminal will undergo a renovation and get a big new UA Club sson.